The jelly bean is a semi-soft candy, shaped like a bean and generally fruit flavored. Long considered a traditional Easter candy, jelly beans are also produced in seasonal colors for other holidays such as Halloween and Independence Day. Basic jelly beans (sometimes also called “pectin beans” because their gel-like centers are flavored with fruit pectin) come in nine colors—red, black, white, green, yellow, brown, orange, pink, and purple. Typically, the bean has the same flavor and color in both the candy center and the sugar shell. As former President Ronald Reagan’s favorite candy, the jelly bean experienced something of a resurgence in the 1980s, and many “designer” or “gourmet” flavors were introduced. These newer incarnations include more exotic fruit flavors like blue-berry, pear, cantaloupe, peach, and watermelon; beverage-based flavors such as root beer, champagne, mai tai, and daiquiri; and dessert or other sweet flavors such as bubble gum, marshmallow, mint, cheesecake, and cinnamon. The names of the flavors vary with the manufacturer, and the processing may be varied as well so that the particular jelly bean flavor resembles its “real world” counterpart. For example, the watermelon-flavored bean has a red candy center and a green hard shell like a real watermelon, and a mixed fruit or “tutti-frutti” bean may have a pink center and a speckled exterior to suggest its mix of flavors. The exact origins of the jelly bean are not known, but it seems to have appeared around 1900 with other shaped candies. The jelly bean has a longer shelf life than many other confections, and its size and durability make it portable. Like other small treats, it was sold as “penny candy” through the first half of the century, including during the Depression. By segregating beans by color, retailers were able to sell jelly beans for particular holidays. In 1976, the gourmet jelly bean was invented by the Herman Goelitz Candy Co., Inc., and the candy assumed a new life as a delicacy. Jelly beans were a fixture of the Reagan White House, and they have flown on the space shuttle as well. New flavors are developed in keeping with taste trends, so the future of the humble bean in both traditional and new guises seems assured. The basic ingredients of jelly beans include sugar, corn syrup, and food starch. Relatively minor amounts of lecithin (an emulsifier), anti-foaming agents, beeswax or carnauba wax, salt, and confectioner’s glaze are also added. The ingredients that give each bean its character are also relatively small in proportion and may vary depending on the flavor. These include natural and artificial flavors and colors, and, depending on the bean flavor, may include chocolate, coconut, fruit as puree or juice, peanuts, vanilla, oils, cream, or freeze-dried egg, milk, or fruit powders. The “design” of the jelly bean was time-honored until the mid-1970s when the gourmet or designer jelly bean was developed. Although the shape remained fairly standard, gourmet-type beans are typically smaller and softer than traditional jelly beans. The colors and flavors also are more varied, and flavors that decrease in popularity are phased out, while new ones are added in keeping with other candies popular with children and other food fads and trends. Intentional in its design or not, the smaller jelly bean is touted as a low-calorie treat because jelly beans contain little or no fat, and there are about 150 calories in 2 tablespoons of small jelly beans. Also, some manufacturers make a slightly larger jelly bean for holidays like Easter, Halloween, and Christmas. Forming jelly beans and many other candies does require design and development of the molds used in casting the shapes. * 1 Each manufacturer’s jelly bean and each new flavor/color combination begin in a chemistry laboratory, where the right balance of ingredients is mixed and developed in test batches. New designer flavors are suggested based on marketing studies, and the flavors are tested for taste and visual appeal in the laboratory. Subsequently, a new flavor will be manufactured over a trial time period and test marketed. If the flavor proves popular, it will become a new product. The chemists also develop new flavors with an eye toward the consumer’s interest in natural products, and they evaluate its “nutrition facts,” including ingredients and caloric content. * 2 After the chemists have fine-tuned their recipe, the candy kitchen creates the syrup that forms the jelly bean center by dissolving the sugar and other ingredients in large boilers where the syrup is cooked to the proper temperature and consistency. Flavor and color for the bean center are added to the syrup, which is then piped to the starch casting area. The kitchens also mix and cook the flavor and color syrups for the panning process described below. These syrups are carefully transported to the panning room and are added in measured doses during panning. 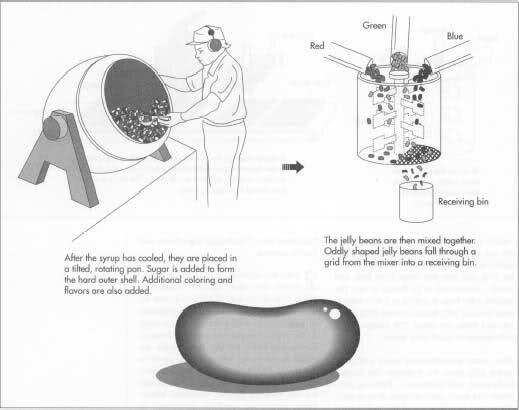 * 3 Formation or shaping of a single jelly bean begins with a process called starch casting. Dry corn starch is a fine, white powder that retains impressions or shapes well. A machine called a mogul deposits a layer of corn starch in a plastic tray and moves the tray to a machine die, which presses dents into the corn starch. Each tray may contain several hundred to over 1,200 of these impressions or dents, each of which is the size and shape of the center of a jelly bean. The mogul moves the trays to a depositor or “filling station” where heated candy syrup is squirted into the tiny molds. From the mogul, conveyors carefully move the trays to cooling rooms in which temperature and humidity are controlled and where the liquid candy cools and sets up to form the gummy center of the jelly bean. * 4 The panning process gives the jelly beans their outer color and flavor, protective sugar shells, and shiny glaze. The trays of candy centers are dumped out. The corn starch absorbs moisture from them during the cooling process; but it is removed, dried, reprocessed, and recycled to create molds for more candies. The centers, which are all the same flavor and color, are placed in stainless steel vessels called “pans” that are globe-shaped and hollow with an opening at one “pole” of the globe. Just like globes, the pans are tilted on their axes so the candies can be placed in them easily and so workers can add other ingredients through the openings. At the bottom “pole” or axis end, the vessel is linked to a rotating power source. The pans rotate the jelly bean centers several hundred times per minute. * 5 Sugar is added through the opening, which gradually builds up on the soft center to form a harder, sugar shell. Workers add colors and flavors during the panning process by pouring beakers of syrup supplied by the candy kitchen through the opening in the vessel. They can also observe the jelly bean shells as they form and become colored throughout the process. The beans are essentially finished at this point but are rather dull-looking. To give them their glossy coats, a glaze of confectioner’s sugar is added while the beans are still revolving in the pans. * 6 The process of making the jelly bean takes 6 to 10 days, depending on the kind of bean and the manufacturer. Packaging is the final step before sending the jelly beans to distributors. Jelly beans are placed in trays after panning and are still segregated by color or flavor. The trays of candies are taken to a large bin where they are dumped in and mixed to the desired combination of colors and flavors. The mixing bin is a large, rotating cylinder. On one side, a grid is set in the wall of the bin. Beans that are too small fall through the openings in the grid and into a receiving bin, while beans that are too large stick in the mesh and are removed later. The beans that continue rotating are therefore only the desired size and shape. They fall from the mixing bin onto a conveyor, where workers inspect them and remove any candies that look imperfect. The beans that pass inspection move on the conveyor to a packaging machine, where the candy is weighed and bagged in any of several sizes of bags either for bulk sale or purchase by individual consumers. The packaging machine can package and seal about 80,000 bags of jelly beans a day. * 7 Exceptions to the sorting and mixing process occur when jelly beans (usually the gourmet type) are packaged by single flavor, or when the flavors are separated in small compartments in gift or “sampler” boxes that let the taster experience the unique flavors of designer beans. The candies are still sized and inspected, but individual flavors are then placed in funnel-like bins. The small openings fit the compartments in plastic trays in the gift boxes, and a controlled quantity of each flavor is dropped into its specific tray compartment. Although the candies are thoroughly mixed to try to get an equal distribution of colors, the randomness of conveying and sorting may cause some variations in the mix. The consumer who purchases the larger bag has a better chance, statistically, of getting a near-equal distribution of colors and flavors. Slight variations in size and shape account for one bag of jelly beans containing more beans than the next, even though the contents are weighed. Some manufacturers put more than the stated weight in each package, so the customer may actually get more beans than paid for in each bag. Jelly beans, like any food product, must meet many regulatory requirements for safety and quality. All ingredients are supplied by vendors and inspected for correct quantities, quality, integrity of packaging, and other criteria. Equipment and materials that contact the food ingredients and product are inspected and cleaned daily or between batches as necessary. Packing materials that contact the jelly beans are formed and handled by machines that are also cleaned daily. There are a number of product quality assurances among the manufacturing steps, starting with laboratory testing, tasting, observation of color quality, and both machine sorting and inspection to identify and oust imperfect candies. Factory workers wear special clothing required for food handlers. Because they are working with equipment that generates high heat, has revolving parts, requires electrical supply, and imposes other safety hazards, workers are also protected by a myriad of safety requirements. Some jelly bean factories allow visitors to tour. They are kept at controlled distances from food processing both to protect the visitors and to isolate the candy from possible contamination. The jelly bean making process generates very little waste. Sometimes the candy centers are malformed, or the molds collapse, forcing several candies to congeal. These are melted and reused or recycled to salvage the sweeteners. Some manufacturers package and sell imperfectly shaped but edible beans selected during final sorting and inspection. New developments are most likely to include changing flavors among gourmet beans as the taste of the consumer follows the latest fashion. Other “revolutions” in jelly beans are less likely, and the future of the jelly bean as an icon among candies seems secure. Brach & Brock Confections. 401 N. Cicero Ave., Chicago, IL 60644. (312) 626-1200. Goelitz Confectionery. PO Box 1050, 1501 Morrow Ave., North Chicago, IL 60064. (708) 689-2225. Do you like this money making business idea? then please consider subscribing to our PINOY BISNES RSS feed. You can also subscribe by email and have new articles sent directly to your inbox. (Once you entered your e-mail address, you need to login to your e-mail account and click the link to confirm your subscription).